In today’s sponge painting for kids art project, our featured artist is René Magritte, another surrealist artist. He is very well known for painting ordinary objects in unusual ways. 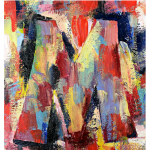 Many of his paintings challenge the way the observer sees reality. Magritte was born in Belgium in 1898. He began taking drawing lessons in 1910 and not much is known about his early life. 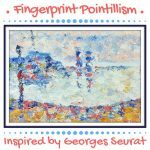 His earliest paintings were impressionistic in style and in 1926 he created his first surreal painting. Magritte liked to give new meanings to familiar things in his paintings. His style of painting is more representational than other surrealists such as Dali. Many of Magritte’s paintings depict everyday objects such as an apple or a tobacco pipe, but no matter how realistic he depicted an object, it would never be the object itself, simply an image. A visual contradiction of sorts that Magritte presents with his artwork. The use of recognizable and simple everyday imagery in unusual context is very similar to the Pop Art movement. Many have recognized Magritte to be an influence in the development of Pop Art, although he denied the connection himself. 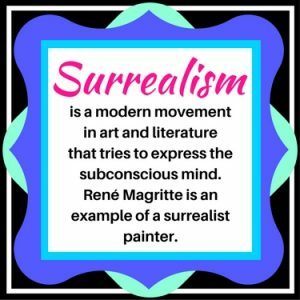 Magritte’s art has inspired many modern artists and became extremely popular in the 1960’s. 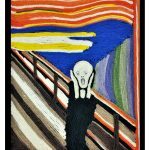 His art has also influenced numerous songs, movies, and books. 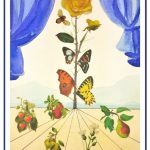 For this art project, The Promise, 1966, by René Magritte is our inspiration. 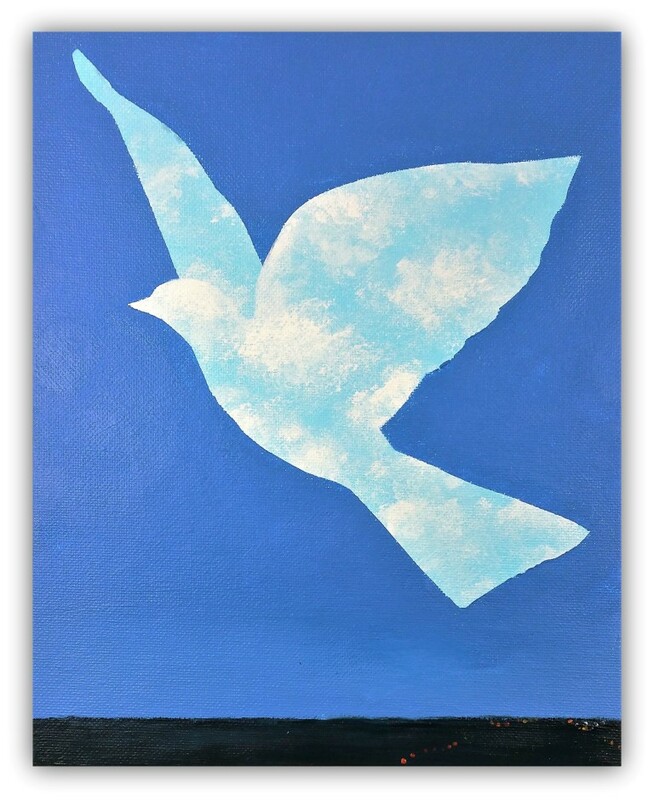 The first step of this project is to create the cloud background for the dove. 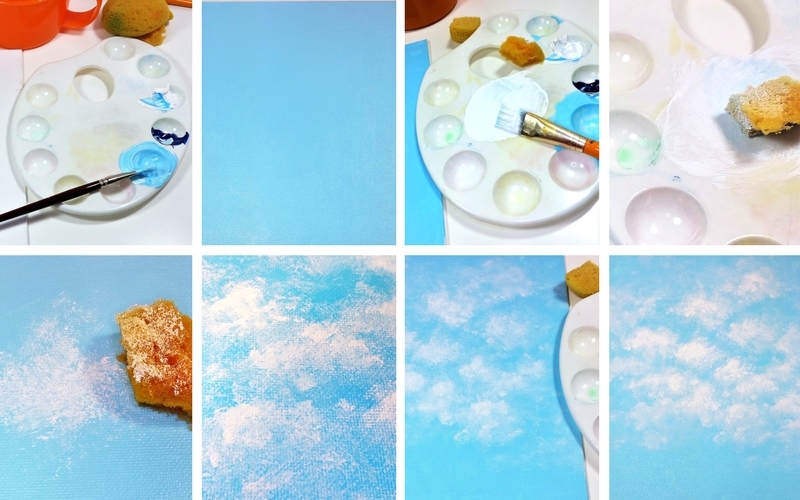 Follow the steps below to create your cloud background. Mix a sky blue color by mixing blue with white until you have a color you like. 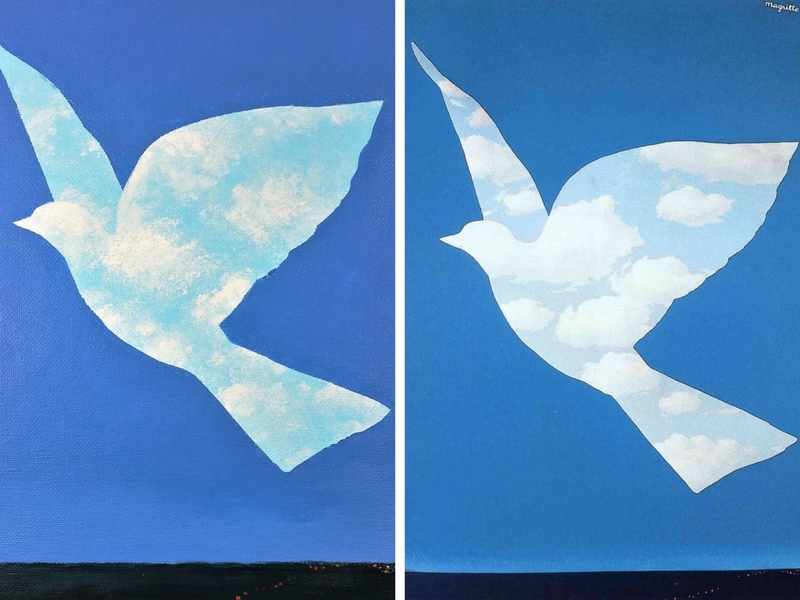 Use Magritte’s painting for inspiration or create your own sky color. Paint a flat layer of sky color to completely cover your canvas and allow to dry. Mix white paint with a little bit of water to make it easier to apply with a sponge. Dab your sponge into the white paint and apply paint to the canvas with the sponge using light dabbing/stamping motions. The more pressure you apply the darker/thicker your paint will apply. Apply paint with various pressures to give your clouds some variation. You can rub and blend some of the clouds into the blue background with your fingertips to create soft, blurred edges on the clouds. Apply as many clouds as you would like. Focus mostly on the center area of the canvas and don’t worry if you don’t fill the whole canvas. Allow your clouds to completely dry. The next step requires adult supervision, or an adult/teacher may do this step for young children. 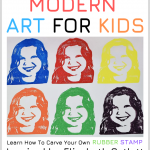 Place the printed version of the artwork on top of the cardstock and place them on a safe cutting surface. Use the X-Acto knife to cut completely around the large dove shape. Separate the dove shape from the rest of the paper. The cardstock dove shape will be used as a reverse stencil for the next step. 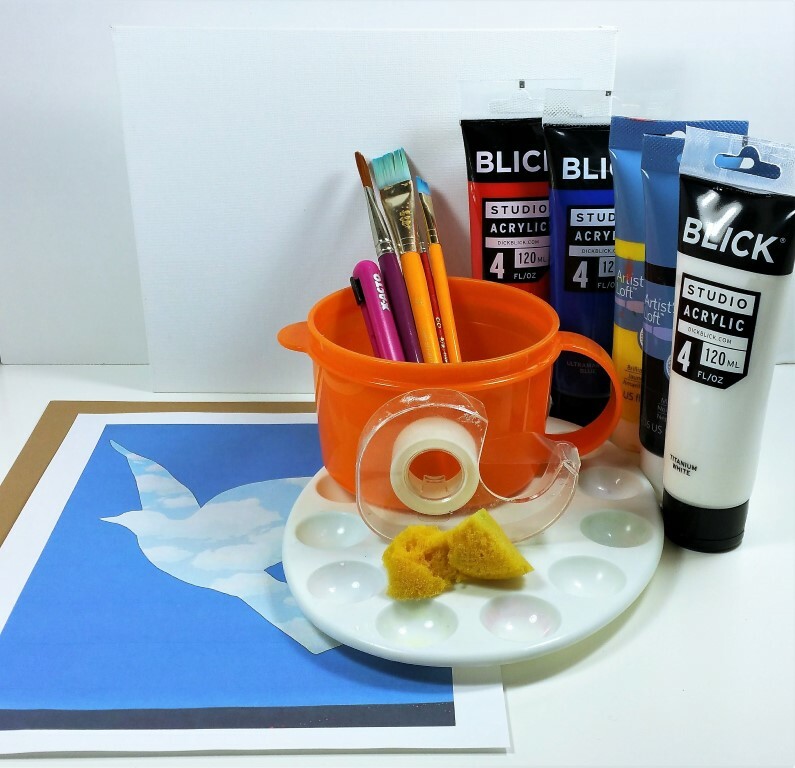 Use scotch tape to secure the cardstock dove to the center of the cloud painting. Use the inspiration piece as your guide for placement. Now it’s time to paint the sky! 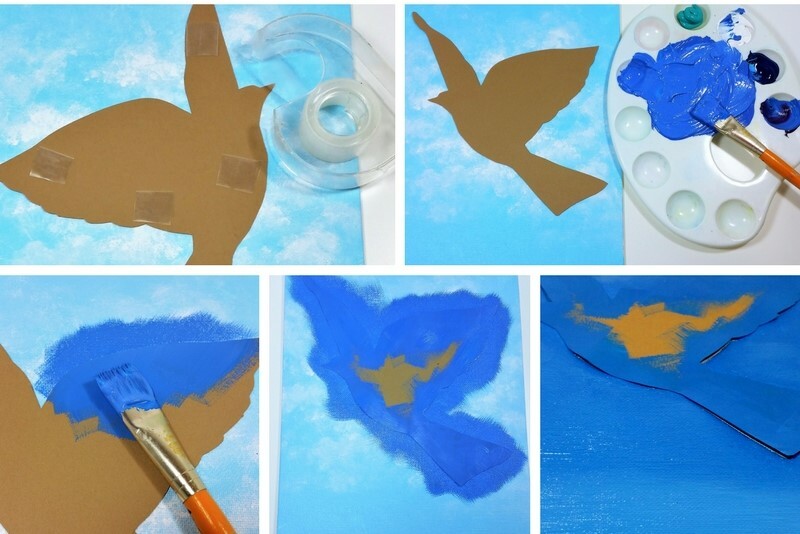 Mix some darker blue paint to paint the sky around the dove. As you apply the paint, start with the brush on the dove and brush outward to create a nice clean edge and protect the cloud area under the dove cutout. 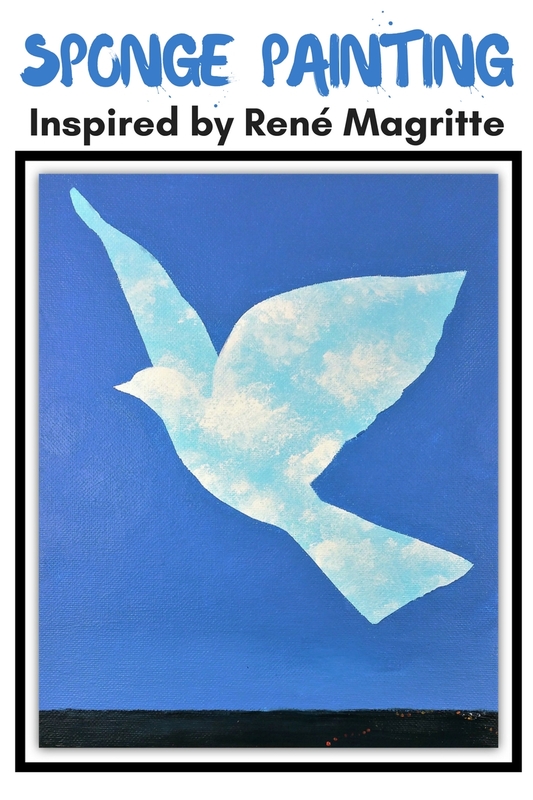 Once you’ve gone over all of the edges of the dove, cover the rest of the canvas with the darker blue paint. (But what about my pretty clouds you’re thinking? Don’t worry – you will still have enough!). Allow the blue paint to dry (you can use a hair dryer on the low setting if you’d like to speed up the process). Finally, finish off the painting by mixing some black paint with dark blue to create a darker color to paint along the bottom edge of the painting. Use a small detail brush to add a few dabs of red and yellow paint in the lower right corner and allow the painting to dry. Once the painting is dry, C A R E F U L L Y remove the dove cutout and viola! Your clouds have reappeared. Your painting can be finished at this point or you can add one more level of detail. 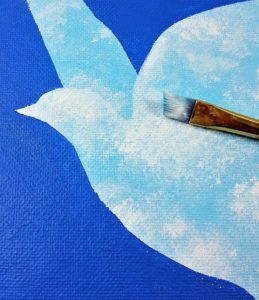 Using a small brush and some white paint, paint a softened line that extends from the back of the dove’s head, along the back and connects to the wing (see the “V” shape between the head and wing). 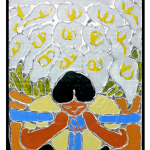 This creates more separation between the dove’s head, body, and back wing and adds a more depth to the painting. 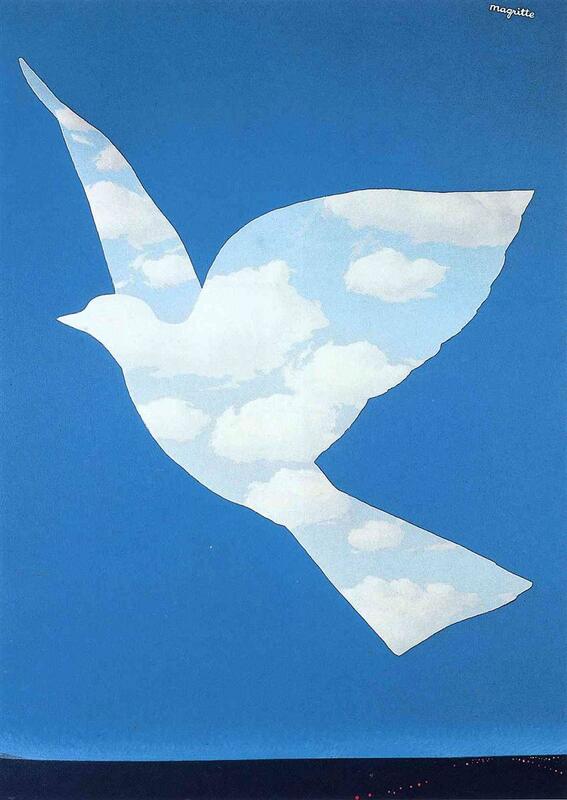 Your Magritte inspired promise dove is now complete! The original, The Promise, alongside our painted version.